Magnets!!! This trend is one I’ve been watching from afar. The initial price caused me to be reluctant to give this look a try. The prices have declined so I’ve admittedly taken a closer look but still didn’t purchase. But, it was obviously magnetic fate! A gift from the lovely Cheryl landed a beautiful bottle of Sally Hansen magnet polish in my happy little hands. In addition to enjoying the final outcome…I had a BLAST with the application. It’s a breeze to apply. I’m already thinking of other colors and designs. Decisions…decisions. That’s how my Saturday blog post began. 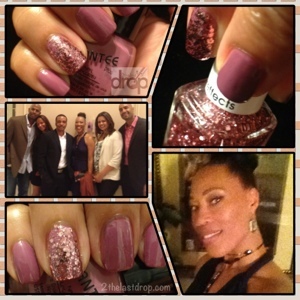 After browsing through my nail polish collection I chose “date nails” inspired by my nail blogger buddy Bridget. We had an awesome triple date in Beverly Hills. I can’t wait for the next time. 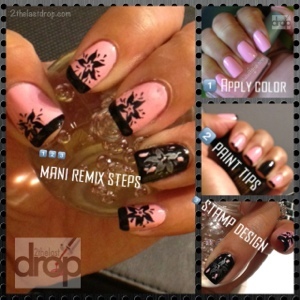 A manicure remix in 3 simple steps! My manicure suffered a few (non-life threatening) injuries following an evening doing yard work. This remix was simple and allowed me to enjoy being “tickled pink” just a little while longer! What are YOU wearing and how are you feeling? Tickled pink is made by wetNwild Cosmetics. It’s finally time for me to tee off! 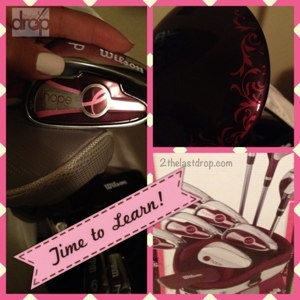 My Mr. has been asking me to learn to play golf so we can play together. He made this his official Father’s Day request so now I’m practicing my swing. Hot date tonight. Decisions…decisions. There is so much polish and so few nails.